Ghosts Counting Oranges A Dutch ghost said to be able to count the oranges in a contest of psychical skill. Here’s a Dutch Ghost Said to Be Able to Count the Number of Oranges Spilled from a Bag. Photograph Is Sent From Holland in Bid for $5,000 Prize Offered by Psychical Society. To be honest, this photo of a Dutch “ghost” submitted by an optimistic Dutch researcher was what first attracted me to this story. 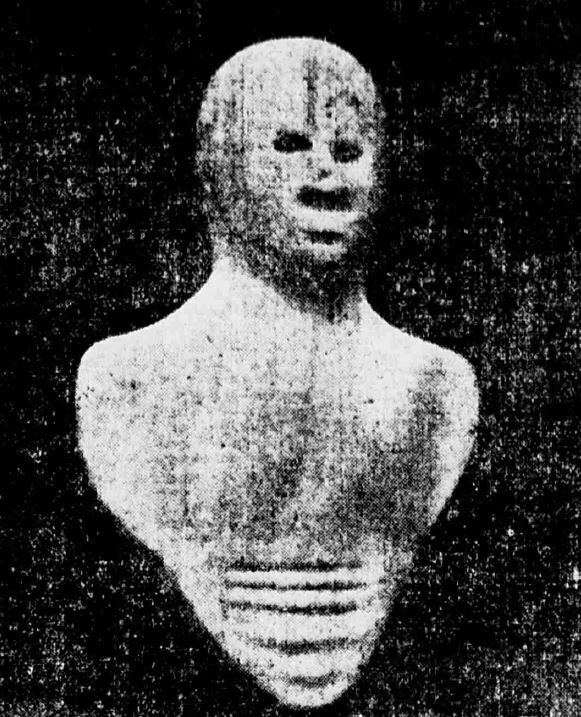 I suppose it is no worse than the painted muslin masks used to impersonate spirits in the séance room. What do you suppose it was modelled from? Plasticine? Clay? Those are some abs, or are they supposed to be folds of ectoplasm? In 1922 Scientific American offered $2,500 for “a visible psychic manifestation” and another $2,500 for a “spirit photograph” produced under their test conditions. Since then a host of cash prizes for paranormal activity have gone unclaimed including the notorious million-dollar reward offered by the late James Randi. But long before Scientific American put its money on the séance table, The Metropolitan Psychical Society dangled a tempting prize for a very simple test. Flood of Arithmetical Spook Propositions Pours In, but in the End All Have Balked at the Test. If they can, and any gifted spirit will so far oblige the medium who calls him from the vasty deep as to tell correctly the number of oranges spilled from a paper bag behind the medium’s back, he will earn $5,000—offered by the Metropolitan Psychical Society. Of course, the medium will get the money—he always does—but as we know from the recent testimony in the Pepper-Vanderbilt case in Brooklyn, as well as from many other sources, that the spirits are always so solicitous of the material welfare of the mediums as to urge the bestowal upon them of sealskin coats and real estate, this fact should make no difference in the test. The Metropolitan Psychical Society, of which James L. Kellogg, of No. 229 Broadway, is president, and W.S. Davis, of No. 22 Spruce street, is secretary, wants the spirits to declare their existence beyond the possibility of skepticism, and to make it easy for them to do so, its members have subscribed $5,000 to be given to that medium who passes the orange test. When a medium announces that a spirit is in the room who can see, we will noiselessly spill a few oranges upon a table behind the medium, so that she cannot see them. We will also keep our own eyes in another direction, so that we do not see them (thus eliminating the question of telepathy). But the spirit, who is in the room and sees the oranges, can communicate the number to the medium. If the spirit does this often enough to render coincidence improbable, the medium will be presented with the money. “Dear Sir—We read in the Nieuwe Rotterdamsche Courant (a Dutch newspaper) that your society rewards the person who is able to give convincing proofs that living beings can communicate with so-called dead ones, the reward being $5,000. It was written in the form of an academical thesis and sent by us to the Academy of Science at Amsterdam. In it was appended the next five hypotheses, basing them on physics, mathematics and philosophy. “1. After the first form of life of man a second one can begin. “2. No ghost (spirits) can escape the influence of the attractive power of the earth. “3. The ghost can exert a certain influence on men. “4. In the second form of life of a man, especially the right of the stronger, is valid as throughout nature. “The various manifestations of spirit communication,” continued Mr. Davis, “can be explained in three ways: (1) fraud; (2) telepathy; (3) Spiritism. Our orange test eliminates all possibilities of the first two. No spirit has yet succeeded in communicating to a group of human beings anything that some one person in the room did not know. Now, as no one in the room will know how many oranges have been spilled on the table, all their backs being turned, the spirit, who will of course be present, will have to count them for himself and tell the medium. “If he does it, the medium will get the $5,000. But I don’t believe he can do it. “Of course, the test will have to be made in the society’s rooms, to eliminate the possibility of cheating by fraudulent placing of mirrors or the training of a telescope from the floor above, as sometimes happens. “And let me tell you this,” the spirit chaser added, emphatically, “there is almost as much fraud among alleged investigators of psychical phenomena as among the so-called psychics or mediums. The public has been greatly misled by them. “For one thing, these men are making a vulgar and unjustifiable display of titles acquired in entirely different vocations. As a matter of fact, a title doesn’t always indicate proficiency in the profession in which it was secured, and it is almost charlatanism for any “Professor” or “Doctor” to prop up a personal hobby with a title secured in a college, when that college nether teaches nor sanctions such hobby. “The constant flaunting of a title, or the incessant reminder that a man is a ‘scientist,’ is, I think, contemptible, when we bear in mind that neither his title nor his particular field of science is in any way related to his spiritistic views. There are also other men who are exploiting Spiritism under such titles as ‘the Reverend’ and ‘Reverend Doctor,’ notwithstanding the fact that such titles do not vouch for efficiency in grappling with possible sharp practice and deception. Prof. Hyslop and Dr. Funk. “In the June number of the Journal of the Society for Psychical Research Prof. James Hyslop, formerly of Columbia College, published an article detailing certain remarkable experiments with a Mrs. Quentin. “Several times during the article Prof. Hyslop stated positively that the persons present during the experiments were total strangers to Mrs. Quentin. Yet less than a month later, when I wrote him asking for permission to be present at a subsequent test of Mrs. Quentin’s powers, Mr. Hyslop replied that it would be impossible, as Mrs. Quentin had always refused to submit to the tests except in the presence of one or two friends and himself. Here is the article and here the letter.” And Mr. Davis read them both to me. “Then there is Dr. I.K. Funk, of Funk & Wagnalls. Dr. Funk has been deluded by a lot of cheap tricksters. Why, he even believes in Mrs. Pepper and her reading of sealed letters from her ‘pulpit,’ in Aurora Grata Cathedral in Brooklyn. Why, those sealed letters were stolen from people as they entered the church by accomplices, purporting to be ushers, who pretended to taken them up to the pulpit. Instead, they took them into an ante-room, where Mrs. Pepper opened them with the point of a lead pencil, or made them transparent as glass by wetting them with alcohol 95 per cent. pure. The Pepper-Vanderbilt case was that of Mrs Mary Scannell-Pepper-Vanderbilt, Minister of the First Spiritualists’ Church of Brooklyn, dubbed the “Spook Bishop,” by the newspapers. She married lumber dealer Edward Ward Vanderbilt whose late wife had attended Mrs. SPV’s seances. After her death, “Little Bright Eyes,” Mrs. SPV’s Native American spirit guide, urged Vanderbilt to marry the medium and directed him to lavish gifts on her and sign over the bulk of his property, making her sole executrix of his will. The honeymoon was scarcely over when Mr. Vanderbilt’s daughters, brother and sister brought suit claiming that he was mentally incompetent, possibly insane, and had been unduly influenced by the bewitching medium. Mrs. SPV vigorously denied the charges, disingenuously explaining away letters from “Little Bright Eyes” about financial matters by saying they were written while she was in a trance state. Mr. Vanderbilt was first declared incompetent and Mrs. SPV was indicted on a charge of Grand Larceny for obtaining the deed to one of Vanderbilt’s houses by fraud. After two years legal wrangling, the incompetence verdict was overturned by a later trial and the charges against Mrs. SPV were dismissed. Mrs. SPV died in 1919; Mr. Vanderbilt died in 1926, having cut off his daughters without a penny. But back to the contest. Call me naive, but I can’t see that oranges can be spilled “noiselessly.” It seems far too easy for the medium to gauge the number by ear. But, of course, nobody claimed the prize, so perhaps it is harder than it sounds. The details about exactly where the medium would be when the oranges were spilled also varied by newspaper; some said they could be anywhere in New York. It is also odd that the Society and the newspapers always referred to the medium as “he,” when most mediums were female. Without further parley this ponderous applicant began to act the part of Macbeth, giving the lines perfectly, but swinging his arms wildly. His acting finally became so violent that Mr. Kellogg and Mr. Davis feared he would have a stroke of apoplexy, so they asked him to desist. In order to weed out the “spirit fakers and guessers,” Kellogg and Davis made up a preliminary test, involving sensing the contents of a tray of common objects and a sealed envelope containing three common words. Despite this, the Society, after being overwhelmed by applicants and poor results, withdrew their challenge, although I have seen 1909 articles in the United States and Germany suggesting that the prize was still being offered. Psychical Society Will Withdraw $5,000 Offer for Test. President James L. Kellogg of the Metropolitan Psychical Society, which recently offered a prize of $5,000 to any medium who would count a few oranges spilled behind him, announced Saturday that the offer would be withdrawn Dec. 31. The fact is, the society is very despondent over the poor results obtained up to date. Thousands of applications, said Mr. Kellogg, have been received since the offer of the prize was made late in the fall. Every promising applicant has been put to a slight and simple preliminary test, but no one has stood it. Applications have come from every state in the union and many of the European countries. To the most positive of these applicants, Mr. Kellogg or W.S. Davis, the secretary of the Metropolitan Psychical Society has replied, usually proposing some such test as locating in the office of the society an envelope containing three words in every day use or a tray containing several small articles familiar to all. In no case has any medium, no matter how confident his or her claims, been able to guess right. Mr. Kellogg himself now uses the word “guess,” when speaking of these answers. The fact is, he is perhaps just a little bit disgusted. David Goldberger, the treasurer of the society, has deposited that $5,000 in the bank and is impatiently waiting to check it out to some one who can count the oranges. “I will give $100 as compensation for his trouble to any one, whether he is a medium or not, who will stand the simple preliminary test of reading words written on the back of a card or sealed I an envelope. But to sift out the insincere, applicants will be required to deposit the small sum of $5 with any newspaper in New York, to be contributed to some charitable institution of the city in the event of his failure to stand the test. Considering the thousands of applications, offering compensation seems a bit disingenuous. $5 was not an insignificant sum of money in 1908.